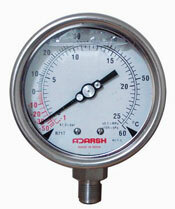 Adarsh Ammonia Gauges are specially designed to sustain against vibration, sudden pressure and temperature conditions. 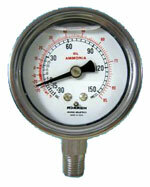 Ammonia gauge are used to measure suction and discharge pressure on Ammonia compressors. 4 Availalble in dial sizes 2-1/2", 4"
4Dial size - 2-1/2" or 4"
Dont buy cheap ammonia gauges, it could lead to leakage of ammonia in your plant which could be dangerous. 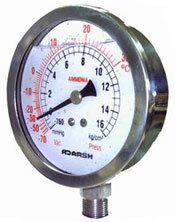 Always prefer ADARSH Stainless Steel Ammonia Gauges for longer use. It features a Glycerin Filled Stainless Steel Case with Argon Welded SS316 wetted parts. Available in both bottom and back connections. Call +91-22-29275496 or email at sales@adarshpressuregauge.com . The gauges are available in all major Indian cities through our dealers and across the globe too.